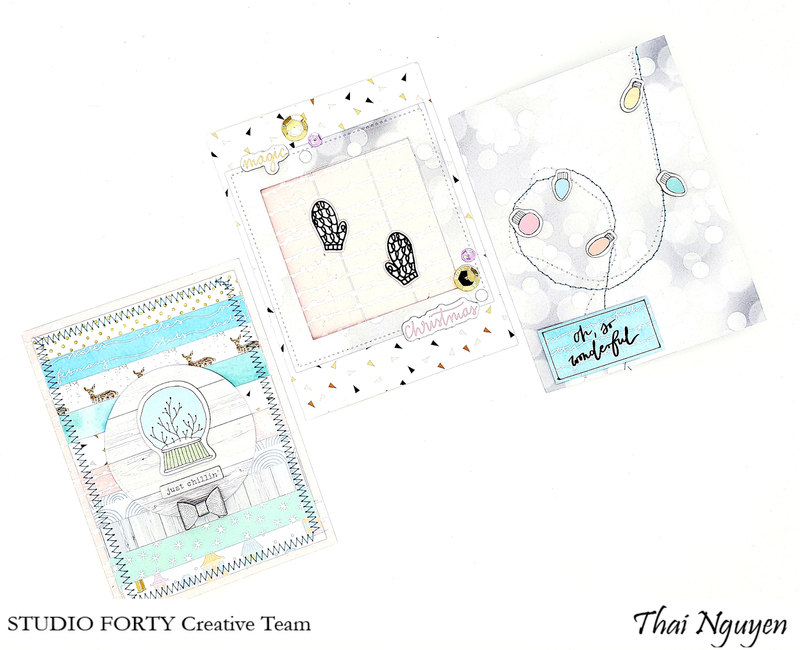 This is Thai and I'm back to show you 3 fun cards I made for Christmas with the new Just Chillin' winter collection from Studio Forty. 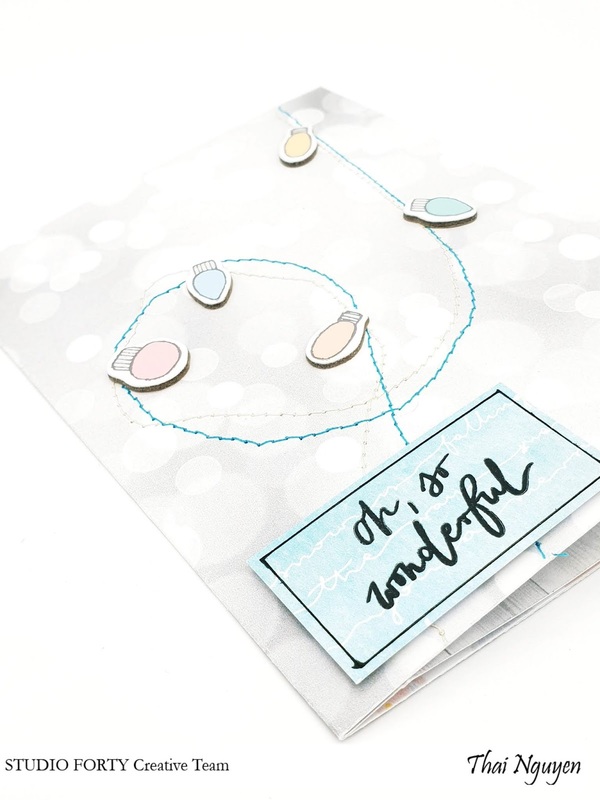 I love the soft pastel colors of this collection! It looks super modern and sparkly, so different from other classic Christmas collections. For those cards, I wanted to include some stitching! Let's have a look at the first card. 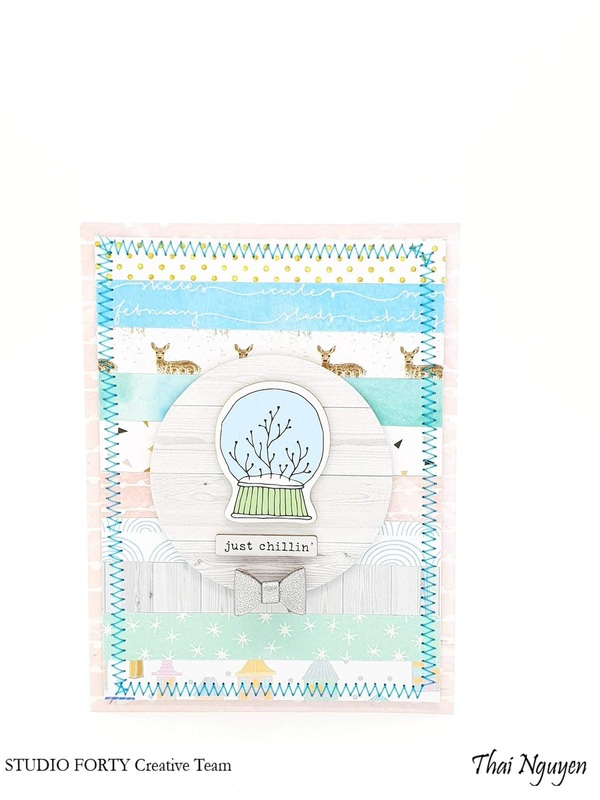 This one is all about using the scraps from your papers. I used small stripes of papers and glued them together to create this patchwork background. I even added some real stitching in blue all around so everything stays in place but also to add a cozy touch to the card. Last step is to decorate the center with a snowball chipboard, a sentiment and a cute faux-leather bow. Now, let's move on to the next card. For this card, I started by stitching randomly the front of the card using my sewing machine. I added the cute lightbulb chipboards so it looks like a garland. 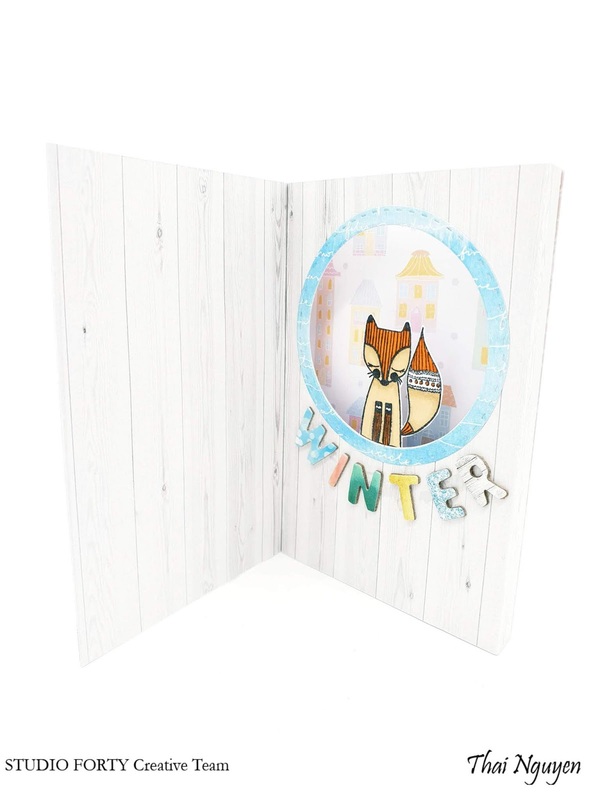 For the inside of the card, I wanted something different and fun so I created this easy shadow box where the cute little fox (that I have stamped and colored with alcohol markers) shows up from behind the window. 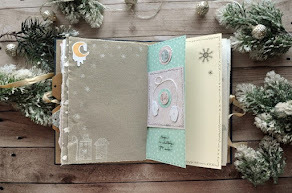 And finally for the last card, I have created a square window and a faux-stitched frame from where 2 gloves are hanging. This is a fun and easy technique to create some movement on your card: how nice it is to open the card and see the gloves turning around. Just add 2 pieces of thread, stamp the gloves (2 left gloves and 2 right gloves), fussy cut them out and glue them to the thread. I have to say that the glove stamps are perfect for this, as they are totally symetric... Yay! 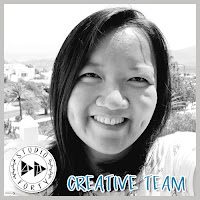 I hope you have enjoyed those card ideas and now you're ready to make your own for Christmas!